(Dr. Steve Furr) - The five jurisdictional conferences in the United States will meet at the same time July 18-20, 2012. Jurisdictional conferences are held once every four years in the same year as the general conference. Equal numbers of laity and clergy, elected by the annual conferences, will be delegates. The principal business during jurisdictional conference is the election of bishops. This year the Southeastern Jurisdiction will elect five new bishops from 15 candidates. Candidates are generally nominated by an annual conference or endorsed by jurisdictional conference delegates. Any United Methodist ordained elder may be elected bishop by any jurisdictional conference. Each jurisdiction establishes the percentage of votes needed for election. Voting by ballot continues until someone receives the required number of votes. This year the balloting will be electronic, which should speed up the process. The six clergy and lay delegates to general conference as well as six additional lay and clergy jurisdictional delegates from our conference will be representing you at Lake Junaluska. On Tuesday afternoon July 17, each of the Episcopal candidates will give a five-minute address to all of the delegates. Later in the afternoon each candidate will appear before each annual conference delegation for a statement and a time for questions. The last elder from the Alabama-West Florida Conference elected to the episcopacy was Mike Watson. He is now the only living bishop from our conference. Our conference has a strong history of only putting forward leaders who we are confident will make outstanding bishops in the United Methodist Church. Our track record speaks for itself. We seek and search for individuals who would continue the legacy of Bishop Duffey and Bishop Watson. We look for someone who we are not only proud that they are a bishop of the whole church, but that we would also be honored to serve as our bishop. We do not offer anyone up in service to the church that we would not be willing to take back into our own conference as our Episcopal leader. In Rev. Dr. Larry Bryars we have found such an individual. 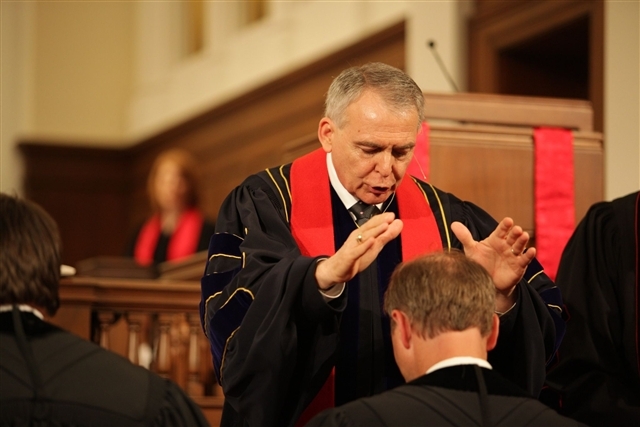 He has distinguished himself by his leadership and growth in the churches he has served as well as his leadership in the Board of Ordained Ministry. The fact that he was elected the first clergy delegate to general conference tells you what the clergy think of his leadership ability. The laity have found a person who truly seeks to be in partnership with the laity in deed as well as word. He has a servant heart as well as a humble yet strong personality. We believe that he has much to offer to our church for years to come. Most importantly, he continually seeks the Lord direction for his path. The first elected lay and clergy delegate to general conference from each annual conference serve on the Jurisdictional Committee on Episcopacy. This committee is responsible for reviewing the performance of the bishops within the jurisdiction as well as making their assignments. Dr. John Ed Mathison is the current chair of the SEJ Episcopal committee. No bishop can be assigned by the committee for the upcoming four-year term until all new bishops have been elected. Once the balloting is complete for the new five bishops, the committee will meet and make assignments for all of the bishops within the jurisdiction. This will be reported to the jurisdictional conference. The jurisdictional conference may affirm or reject the assignments. Newly elected bishops are consecrated in worship services at the end of each jurisdictional conference. All assignments for active U.S. bishops begin on Sept. 1 following the jurisdictional conference. There is an Inter-jurisdictional Committee on Episcopacy, elected by general conference delegates, that can transfer bishops across jurisdictional lines if the bishops and the jurisdictions consent. Please remain in prayer for our delegation as well as all the delegations as we go about this very important process. Especially remember all the Episcopal candidates as this is a very demanding time for them. (Rev. Neil McDavid) - Ten “new places for new people” and three new ministries were highlighted at our recent Alabama-West Florida Annual Conference. New church starts, new second campuses, off-site services, new services, new ministry models and a church re-start are among the ways new people are being reached in small, mid-size, and large churches across the conference. Over the next several weeks, these “new places for new people” will be highlighted in our NewsCONNECTION as a hopeful encouragement to all churches to consider new ways and means to reach out to new people. To discern the way forward for your church in this regard, you are encouraged to join the Alabama-West Florida Conference Prayer Initiative (to see full plan click here). Essentially, every church is being asked to form a prayer team to pray through what it means to “make disciples for Jesus Christ for the transformation of the world” in their particular context. The prayer team would consist of three to five people, including the pastor, who would meet weekly for 90 days beginning September 1, 2012 and pray through four questions (click here and scroll down). Out of this time of prayer and discernment, the church is asked to respond in one of three ways: (1) step up and sharpen the existing focus on making disciples through worship, Sunday school, small groups, men’s/women’s ministries, youth, children and present ministry; (2) step out in making disciples by starting a new community of faith, a new service, establishing a new mission outreach; (3) express a renewed readiness to follow God’s leading for the vision God is placing before your church. The challenge for the church today is to essentially reclaim our missional DNA and recommit to be missionaries in our own communities. As you join the Alabama-West Florida Conference Prayer Initiative consider the seven R’s of revitalization and renewal. For more specific information and resources on the Alabama-West Florida Prayer Initiative, join the AWF Prayer Initiative on Facebook and/or visit www.awfumc.org/prayerinitiative. At the conclusion of the retreat, participants will be invited to make a two-year covenant with UMCH to serve as a member of the spiritual care team. Upon assignment to one of UMCH’s programs, spiritual caregivers will spend ten to twenty hours a week with the staff and the children, youth, and families in care. They will receive ongoing support through individual coaching, group coaching, and continuing education. Caregivers who serve effectively may be invited renew the covenant every two years. For more information contact Rev. Higgins at Rev. Lonna Lynn Higgs 205.919.8298. The 2012 Alabama–West Florida Annual Conference was held June 3-6 in Mobile, AL with the theme, “Partnership in the Gospel....Serving the World.” Bishop Paul L. Leeland, presiding over his fourth annual conference session since becoming the resident bishop, welcomed clergy and lay members to Christ UMC in Mobile. Prior to this year’s conference, Bishop Leeland urged the churches of the conference to receive a special offering for Imagine No Malaria. The people of the AWF Conference responded by contributing over $54,000. The offering collected at the commissioning and ordination service for the Ministerial Education Fund collected over $1,600. The 2012 Annual Conference session was opened on June 3 with hundreds from throughout the conference gathering for worship. Dr. Belton Joyner delivered the sermon, "What Color was the Carpet" based on Philippians 1:3-5, asking attendees if partnership was the same as being in agreement. He said, "Partnership in the gospel is not about being in agreement, or already being in perfection, but about serving the world and in one another, and thus, serving God." A combined worship band provided inspiring music for the service including a moving rendition of, "Holy, Holy, Holy." 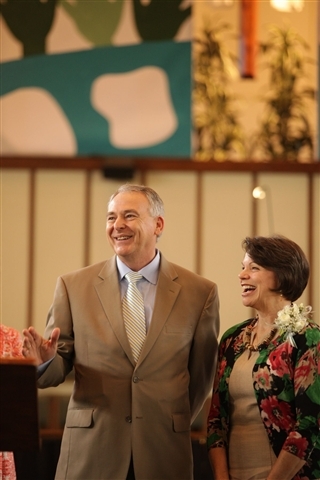 One deacon and two elders were ordained as members in full connection, and one provisional deacon and eleven provisional elders were commissioned on the evening of June 4 at Dauphin Way UMC. It also included the ordination of one being recognized from another denomination. Prior to the start of the service, the chancel choir, chancel ringers, brass quintet and men's ensemble of Dauphin Way UMC presented worshipful music led by John Ricketts. Twenty-seven clergy and clergy spouses who died in the past year were remembered during a Service of Commemoration and Holy Communion. Dr. George Mathison delivered the sermon, "The Hall of Saints." An overflow crowd remembered those that have given many years of service to the conference. Surviving family members were hosted at a special luncheon by the AWF Commission on Archives and History. Twenty-seven clergy retiring this conference year were honored on Monday, June 4. Together, they represent 502 years of combined service to the United Methodist Church. Rev. Fred Zeigler spoke on behalf of the retiring class, passing the torch to Rev. Patsy Winford Gibson. Patsy represented the 2012 class of ordinands. The Conference was honored and blessed by the outstanding leadership of several guest speakers. Coach Mike Gottfried, former football player and coach and EPSN color analyst, gave the fourth annual “Mary Ellen Bullard Leadership Address” during Tuesday’s Laity Banquet. Dr. Ben Witherington, Professor of New Testament for Doctoral Studies at Asbury Theological Seminary, led the conference in two morning Bible studies. Dr. Dana L. Robert, Truman Collins Professor of World Christianity and History of Mission and co-director at the Center for Global Christianity and Mission; Boston University School of Theology, led two teaching sessions. Several awards were given to recognize outstanding leadership and service in the conference. Dr. Gene Watson of Eufaula FUMC received the Francis Asbury Award and Dawn Wiggins Hare of Monroeville FUMC received the Alice Lee Award. Kenneth Elwyn Autrey of Pensacola First United Methodist Church and Freddie McCain of Skipperville United Methodist Church were co-clergy winners of the Denman Evangelism Award. This year's lay recipients are Stan Holmes of Woodbine United Methodist Church in the Pensacola District and Jeremy Fillingim of Creola United Methodist Church, Mobile District youth winner. Kathy Norberg of Gulf Breeze UMC and John Michael Ledkins, along with his parents and church pastor Rev. George Sedberry, of Thomasville UMC were all recognized for their outstanding work in scouting. Dr. Shirley Woodie, AWF Conference Secretary, was recognized by Bishop and Mrs. Paul Leeland for her outstanding leadership in our conference. Dr. Woodie will retire from her duties as conference secretary but will remain active in the conference. The clergy appointments for 2012-2013 may be found online here. A compelling addition to this year's conference was the showing of eight district videos at the beginning of various sessions that informed the conference about fruitful activities going on within each district. Each district superintendent presented this information about their respective district. The conference also participated in an UMCOR relief kit drive yielding more than 1.275 relief kits. The 2013 budget was established at $11.131 million for mission and ministry, down 2.61% from 2012. Membership stands at 146,782, down less than 1% from the previous year. Worship attendance stands at 66,145, down 2%. Church school attendance stands at 28,131, down 2%. Small groups showed an increase: there was a 38% increase in persons in covenant discipleship groups, 6% increase in short-term classes for learning of all ages and mission teams showed increases in all categories. The 2013 session of the AWF Annual Conference will be held June 2-5, 2013, at Christ United Methodist Church in Mobile, AL. We express our sincere appreciation to the Christ United Methodist Church Leadership Team and Rev. Jeff Spiller for their hospitality during this year's annual conference. A downloadable pdf recap that can be used in your Sunday church bulletins can be found here. Full coverage of the 2012 AWF Annual Conference may be found at www.awfumc.org/ac2012. To see photos taken by Luke Lucas, click here. (Lisa Pierce) - From Friday, May 4, through Sunday, May 6, ten bikers/cyclists crossed Alabama to raise awareness about the housing needs in some of the poorest areas of our country, while raising money for home repairs in Lee, Macon and Sumter counties. The Third Annual Cycle of Service benefited Alabama Rural Ministry’s (ARM) home-repair efforts. Most of the families ARM serves are the elderly, disabled or single parents who live on limited or fixed incomes. ARM also hosts two free summer camps for underserved children in Livingston and Tuskegee. Most of the work is done in the summer time with two mission camps coordinated for visiting youth and church teams. This year’s goal is to raise $30,000, which will be applied to the cost of purchasing the construction materials we use in repairing homes for up to 30 families. Riders had already raised more than $20,000 toward that goal. Sponsors include the Alabama Retail Association, Best Copies, Carr Allison, Country’s Barbecue, Dilworth Development Inc., Dynamic Sports Products, James Bros. Bikes, J. Smith Lanier & Co., Mann’s Wildlife Timberlands, Scott Bridge Co., Shakey’s Pizza, Singleton Marine Group, Leigh Ann Tyler/State Farm Huntsville and Young Photography. Other contributors include the 122nd Troop Support Command Selma, Aldersgate United Methodist Church (UMC) Montgomery, Auburn UMC, Epworth UMC Columbus, Livingston UMC, Memorial UMC, Montgomery Multisport, SES Montgomery, St. Mark UMC Columbus and Tuskegee UMC. We are also grateful to Liberty UMC from Notasulga who served one of our families, Ms. Sweeney, on Saturday May 5th! They repaired sheetrock and electrical work after Ms. Sweeney’s home was broken into and vandalized for her copper wiring. You and your church can still contribute to the cause now by credit card at http://cycleofservice.arm-al.org or mail in a check to P.O. Box 2890 Auburn, AL 36831. Bikers participating in the Cycle of Service rode during most of the day and then helped with community events. Profiles of the riders can be found at http://cycleofservice.arm-al.org. • State-Line- to-State-Line Challenge including the Century Ride, 250 miles from the Alabama/Mississippi to the Alabama/Georgia borders, begins in Livingston and goes through Cuba, Selma, Montgomery and Tuskegee, then ends in Phenix City. • Century Ride, 115-mile ride on the first day of the three-day ride. • State-Line- to-State-Line Challenge, 223 miles from Cuba to Phenix City. • Final 45 miles from Tuskegee United Methodist Church parsonage to Phenix City. This leg begins at 8 a.m. Sunday, May 6. To see pictures of the ride you can see our facebook profile below. For more information, go to http://cycleofservice.arm-al.org or www.facebook.com/Bikebama.